If ever there was an argument for doing the historic lectionary, the Gospels in Lent build an incredible case. Let’s remember what the Church Year is all about. The Church Year wraps us up into the “year of the Lord” (AD) and binds us to Christ’s life. It’s part of the greater liturgical reality conspiring to work out the truth that we do not do the faith, but the faith does us. The Gospels of Lent brilliantly display this. What have the three Gospels so far taught us? Well, first there’s simply the desert motif. The desert is the place of trial, as it was for Israel. It’s the place where Jesus is driven by the Holy Spirit. The desert is where the Church exists. The desert is where we join Jesus after our own baptisms. The desert is also the “dry place,” the haunt of demons, the place where the devil awaited Jesus. Even as we begin the season confessing we are dust and ashes, we find ourselves in the dry place of dust. The desert is the place of hunger, as Jesus shows us. But unlike Israel whose hunger got them in trouble, Jesus lifts our understanding to a truer meaning of bread. And this leads to the Reminiscere Gospel of the woman crying out for the bread crumb. As we were taught in the desert, man does not live by bread alone, however, but by every Word proceeding from the mouth of God. In other words, the hunger we truly have is fulfilled not by bread, but by the Word of God. Jesus is the Word made flesh, the bread of life. The woman recognized this, crying out for His mercy, for Jesus to drive out the demon from her daughter. She was truly “hungering and thirsting for righteousness.” And she was filled with the bread Jesus brought, and that Jesus is. Last week’s Gospel, Oculi, developed this theme. Jesus is the Stronger Man who drives the devil back out into the “dry places.” He enters our house as we “hear the word of God and keep it.” In the context – of the woman saying blessed are the breasts and womb that “housed” Jesus – Jesus emphasizes Mary’s true “housing” was as she heard Gabriel’s word and kept it. So also us. So we have Jesus, the Word that proceeds from the mouth of God, the bread which truly feeds us by having mercy on us and driving away demons, for He is the Stronger Man. And then we have the desert, the place of hunger, the haunt of demons, the place of “earthly bread” temptations. Emotionally, we’ve dealt with some heavy stuff: the forty days of hunger, the subtle temptations of the devil, the oppressing power of demons, the silence of God, the seemingly insult of God, the rebuking by the disciples (the Church), the return of the seven demons in a swept-clean house. It’s all very real stuff. It’s the stuff we face in Lent. It’s the stuff we face in life, and God help anyone who would eliminate the reality of Lent from the Christian life. And now we get a reprieve with Laetare Sunday, the feeding of the 5,000 in the midst of the wilderness. All the cast of themes comes on stage for an encore performance, save the demonic element. We get a break from them this week. But we have the wilderness, the hunger, the bread, and Jesus. It’s all from John 6, which if we read the whole context will put the whole theme on steroids. Jesus is the bread from heaven, literally descending from the mountain to feed the people before returning back up the mountain. For as He said, “No one has ascended to heaven but He who came down from heaven, that is, the Son of Man who is in heaven.” He is the Word made flesh, “ the bread of God…who comes down from heaven and gives life to the world.” That’s exactly what He does in this week’s Gospel. This is the true bread we hunger for, the Word made flesh proceeding from the mouth of God, the Word we hear and keep, the life in the dry places, the rejection of that “lord of flies,” the one driving the demons away. For the old Sabbath Rest wasn’t really a rest at all, as Jesus said, “My Father has been working until now, and I have been working.” No real rest for God after man plunged His creation back into formlessness and void, handing it over to the devil! And that bread fills our hunger and thirst for righteousness, driving away the devils Satan and Beelzebub out of our houses, the “accusing one” and the “lord of flies,” sin and death. He who came into the world by she who “heard and kept” the Word of Gabriel, born in the House of Bread (Bethlehem), gives Himself to us, our daily bread. Be sure to review the first three Gospels of Lent to properly hear tomorrow’s Gospel. They are profoundly connected. Saturday of Oculi: Why is Mary Blessed? Though a seemingly shift in gears in the narrative – from demons to Mary – there are striking parallels. For the Hebrews, God created the body and infused the spirit into it. The human person is not an incarnate soul – a soul using a body – but an animated body – a body brought to life by the spirit. And in the Hebrew understanding, the spirit was not necessarily a self-subsisting entity, like a ghost, that once freed from the body still had conscious existence, floating around in trans-dimensional regions. The one mention of a ghost, Samuel, informs us he was disturbed from his rest. He was sleeping, hardly conscious. What this is all to say is that Jesus’ house metaphor must refer to the whole person, not just the body. And He makes this clear by His little encounter following the bulk of the Gospel, with the woman who cried out to Him that Mary’s breasts and womb are blessed (as opposed to her as a whole person, body and soul). Now, there is something tantalizing about the body in particular, as far as demons are concerned. Why are they restless until they possess a body? Are they jealous of bodies? Do bodies give them individual existence, freedom, and a fullness of existence they don’t have as networked spirits with identity confusion? (“We are legion, for we are many.”) What exactly is “dry” about being separate from human bodies? All interesting questions, but lets remember the bigger point of the Gospel. There’s a new sheriff in town, Jesus. He’s a body, an incarnate one. He’s not Adam, bound in the basement while Satan rests upstairs watching TV. He’s the stronger man who kicks Satan out. His “house” (the Temple; His body) is freed from the devil. The point is, He did it! Jesus ousted the devil. Jesus’ Person is one, though His natures (divine and human) are two. But when we speak of His actions, we always speak of Him as the one Person. 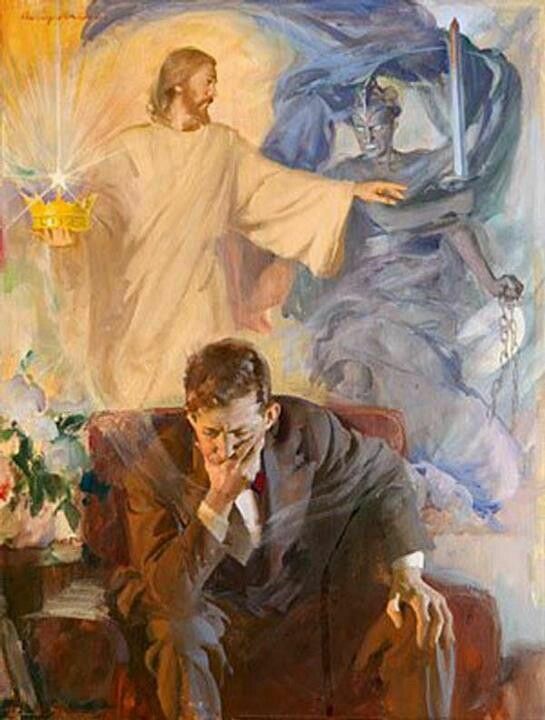 We wouldn’t, for example, separate Jesus into two persons (as the Nestorians did) and say, “Well, when Jesus walked on water He was doing it as God; but when He suffered on the cross He did it as man.” No, the whole Person was involved in every act: Man walked on water and God died, God walked on water and Man died, all this because Jesus walked on water and Jesus died, since Jesus is one Person! Yet, when you do get technical, as Jesus needed to after teaching His disciples about eating His flesh and drinking His blood, Jesus doesn’t save us merely because of the flesh – the flesh profits nothing – but because that flesh is enlivened eternally by the Holy Spirit. And that’s why distinctions are indeed made, because people (like the woman in the Gospel) will so easily miss the point. Jesus walked on water by His divine nature not because there’s some magical potential about human bodies; Jesus suffered on the cross by His human nature, not because God in His essence is subject to human suffering. Well, I believe this episode with the woman at the end of this Gospel is similar. The woman seems to “get it” as far as Jesus is concerned. She recognized that He’s the “stronger man.” And who but the mother of the stronger man would be the first “house” the stronger man would inhabit. So she decides to pontificate about the proper way to receive that stronger man: How blessed must that woman have been who gave birth to the stronger man and nursed him! Surely she had done something special with her womanly body parts, in order to bring this other body into the world and nurse him! Jesus says, “no.” In a sense He says exactly what He did in the other context, “The flesh profits nothing.” It’s not the one who does stuff with my body that causes the strong man to gain victory – that puts the onus on that person! Rather, it’s done in God’s way. And what’s God’s way? To hear the Word of God and keep it. That hearing brings about the “Word made flesh,” and that’s truly how the full person of Jesus – body and soul – is brought into the full house, body and soul. Bodies profit nothing; and your body receiving Jesus’ body profits nothing – that turns your salvation into a religion of works. But the Word of God animating Jesus’ Body certainly profits everything, even as that Word brings His Body into your house and gives you victory over Satan. In the same way, when you receive communion, you always receive His Body – just as Mary truly nursed God always – but the blessing comes not from the mere eating of bread which is Christ’s body, or from nursing Jesus. The blessing comes from hearing the Word, receiving the Body, and keeping it in one’s house. Mary provides a great example. She heard the Word of God and kept it, and through her the Word became flesh and dwelt among us, becoming a tabernacle, a temple, a house. And blessed are all those who receive Jesus as He comes in His Word, in His full Person, body and soul. As they keep Him in their house, the demon and his seven buddies move on to someone else. Friday of Oculi: Is this Gospel about the Scapegoat? There are some disparate strands of biblical imagery that could give an intriguing interpretation of this Gospel. What do we have so far? We have a house, a demon driven from the house, a wandering around in the wilderness, and a return to the house. The house is an image of a man. Where do we see that narrative motif in Scripture, of something unclean being driven from a house into the wilderness? The thing that comes to mind is the scapegoat rite. Accordingly, at the temple (the house of God), the priest would take two goats. One goat was for the Lord and would be sacrificed. 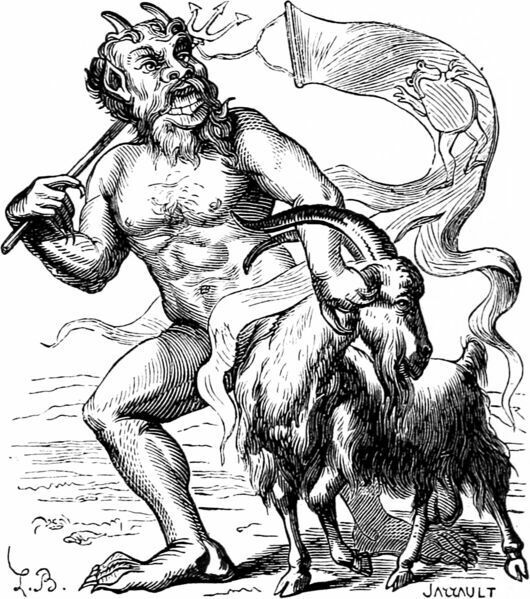 The other goat was “for Azazel” or “for departure” or “the goat of departure” or “a scapegoat.” Azazel by tradition became a chief demon, some even believing him to be Satan. In any event, the image calls for a goat bearing the sins of the people and being offered to a demon out in the wilderness. Symbolically, it almost exactly pairs up with the Gospel for this week. Of course, it also invokes Jesus’ wandering in the wilderness, for He is our scapegoat. He bears our sins. Who drove Him out into the wilderness? The Holy Spirit. Is the Holy Spirit “the stronger man” who drove Jesus, the Scapegoat, the Azazel out into the wilderness? Is Jesus, on man’s behalf, assuming our demonically-possessed bodies and becoming the battleground of all humanity between God and Satan? Well yes, of course. But this is leading to a rather unorthodox reading of this Gospel. Let’s rethink this Gospel using the Temple as the “house.” But remember, Jesus’ body is the Temple, and the Church is the new temple, our own bodies being temples of the Holy Spirit. We have the scapegoat ritual. The goat absorbs all the unclean spirits of sin and guilt, the power of Satan. He’s cast out into the dry places, seeking rest. 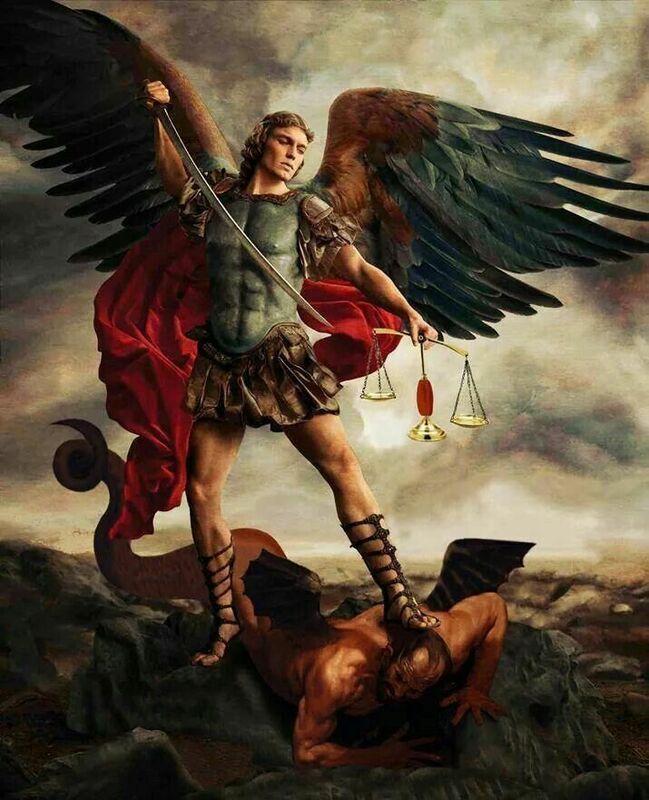 In the end he comes back with seven demons stronger than himself, and they re-inhabit the house from which they came, the temple, the body, symbolized by the body of the Jewish people and their religion. But Jesus is a new house, a new temple, offering a new body, and a new body of believers, the Church. The Jewish temple is abandoned, swept and cleaned, while the new temple moves on, with its stronger man in charge, Jesus, freed of all the demons. This makes Jesus confrontation with Satan in the wilderness pivotal in understanding this text. It was here, on behalf of the “house” (the temple as type of the human body, and ultimately as a type of the whole creation), that Jesus the Stronger man ended the devil’s authority to accuse (or better, began what ended at the cross). Now, what of these “dry places seeking rest.” Azazel means “sent out one” or “goat of departure.” Whatever the case, there’s the sense of “being sent away,” and that into the dry places. What’s the reverse? Interestingly, Jesus had just been baptized before being sent out into the dry places. He’s sent “away from” the wet place into the dry place, the wet place being the place where Jesus removes the sins in anticipation of the cross. Satan’s demons desperately seek the wet, bodily places where they can possibly find “rest” and “peace.” But they are banned, and the best they can do is possess a poor soul, pretending to be connected to the Lord and giver of life through the body. But all they do is destroy, because all they do is lie and deceive, for their rebellion is permanent. But Jesus is the new Temple, the new house, the one forever anointed by the Holy Spirit, and His “stronger man” victory over the devil in the wilderness reverses course. No longer is man under the power of Azazel – sent away into the dust of death with the guilt of sin. No, Jesus as man took that path but then defeated the devil and reversed course. Now, we live in the wet places of our baptism, the place where the waters are “sent” and come gushing forth from the rock, which is Christ. Like I say, there are a lot of disparate strands here. But the Bible often does this, and the layers of meaning are many. When we’re thinking that way, we’re at our default. In a perverse way we’re at peace. Sin has the same effect. What is the allure, after all, of all the vices? What is the allure of anger, lust, drunkenness (and all the drugs), covetousness, and so on? Is there not a sort of peace of mind you get, or rest for your soul, when you first partake of vice? When Jesus the Stronger Man comes, it’s jarring. It’s jarring to hear your comforting and narcissistic self-loathing has no basis now that He’s died for your sins. It’s jarring to hear there’s a better way to live than to indulge the body-denying passions. It’s warfare, and warfare is never pleasant. Jesus and the Word He brings is like a bull in a china shop, the china shop being the arrangement of our souls according to the sinful nature, the carefully ordered glass shelves full of chinaware, all set up according to our elaborate will to self-justification…all idols, but more like a house of cards. And when Jesus comes in, via the ear, and He begins working His fingers in our hearts and mind, it all comes crashing down, exposing the china shop to be nothing more than a continuation of Adam’s fig leaf covering up the chaos and void man’s soul had become. It’s jarring. And how part of us always wants to end that trauma to the system and return to things being “swept and put in order,” the very thing Jesus warns against. No, you need Jesus’ trauma to the system. Your soul needs to be jarred. Because it’s all part of Christ’s call to “take up your cross daily and follow Me.” It’s His call to lose our life, so that we might find it in Him. There is a certain nihilism in this week’s Gospel, the allowance of warfare for a greater good. And indeed, there is a certain amount of nihilism in Christianity, the very thing Karl Marx identified as dangerous, that is, the unwillingness of Christians to make a go of things in this world, to build heavens on earth. The paradox is in the end, Christianity ends up have a net positive effect in this world. Jesus brings warfare leading to the “peace that passes all understanding,” and a rest that’s deeper than a day off. And this, in the end, is far from nihilistic, but the reaffirmation and re-establishment of our very being. When you have a culture downstream from those sorts of souls, good things tend to happen. There are a lot of body references in this week’s Gospel. The big image of the Gospel itself is related to the body – the house which is the human person. And what a curious suggestion lurking in the background that demons somehow find themselves “at rest” in human bodies. And then we have the implicit reference to the body in the name Beelzebub, “the lord of the flies.” Well, why is he named that? It’s because the flies gather around…rotting bodies. Beelzebub is lord wherever death does its handiwork to bodies. And then we have reference to God’s finger, and finally the breasts and womb through which Jesus was brought into our world. 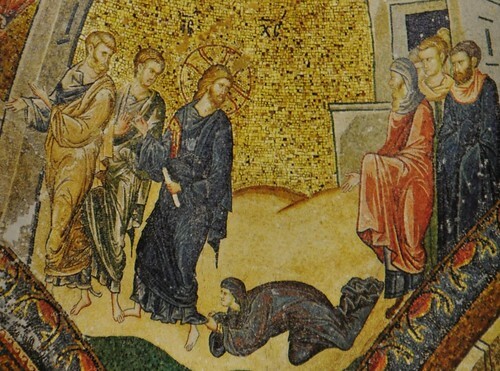 Finally, there’s something going on with the body in this week’s Gospel, titled “Oculi,” based on the introit, or “my eyes,” another body part! Rooted in that title, “my eyes” – and how the light conspires with the eyes to introduce knowledge of specific things, bodies, beings into our minds – how does Jesus’ reference to “the finger of God” contrast with the devil’s attempt to dissolve bodies into a heap of rotting, fly-ridden – soon-to-return-to-dust – flesh over which he rules? Well, right there you see it! By reference to God’s finger, you have reference to something in eternal existence that is a located “other.” Put another way, you have reference to something with borders at which point God ends and other “things” begin. And more, that which is contained withing the borders of “God” (His finger) is the source of life for that which is not contained by those borders, like Michaelangelo’s finger of God touching Adam’s finger. Two fingers; one ain’t going away, one will dissolve back to dust if it ever forgets the source of its life! Satan’s theology (Gnosticism) doesn’t work this way. Satan’s theology would say the divine permeates all things, so that “the God in me greets the God in you,” and but for this flesh keeping you and me separate, we could all be one. Well, in that case the dissolution of my and your flesh is a good thing, paving the way to our “return to unity.” And in that case we should welcome the flies as signaling the tearing down of walls, the wall of our flesh, which keeps you and me separate. God is a limiter, a separater, a delineator, a builder of walls. And he does it to give life and existence to all creation, including us. And it’s a reflection of His own nature, to establish with His Word a beachhead in the “chaos and void” where there is order, life, existence, and being. In Christ – as a consequence of His Triune nature – God “limits” Himself, for it is in the limits in which He has life. And He shares that life. His finger does it, because He Himself actually has a finger. Forget all this metaphorical garbage, as if we have to excuse God’s unsophisticated language in lieu of what the Greek philosophers have educated us on, that of course God is not a being with fingers because He’s spirit. Remember, the only God we truly know is the one who became flesh. And last I checked to have a body is to also have fingers. Now, what of this finger? This finger defeated the Egyptian gods. This finger carved out the Ten Commandments. This finger wrote in the ground when the woman was about to be stoned. This finger stuck in the deaf man’s ears. And this finger brings about the Kingdom of God. And this followed new demonstrations of God’s finger defeating the demons, in this week’s Gospel. It’s God vs. Egypt all over again, but the Egyptian gods being unmasked for what they truly are, demons. What then of this “writing of the law in their hearts”? Surely Jesus was alluding to this new writing of the Law when He wrote with His finger in the dust, forgiving the woman. And surely this prepared the way for the “new covenant in my blood,” a blood that speaks better things than that of Abel (i.e., forgiveness, not vengeance). This is the third Sunday in Lent now with demons or the devil in it. The devil tempted Jesus; the Canaanite woman had a daughter possessed by a demon; and in this week’s Gospel Jesus teaches about spiritual warfare with the demonic, using the analogy of a house. It makes sense we’d see demons and devils in this season. Lent begins in the wilderness – Jesus tempted there for 40 days – and by embracing this divine time frame as our own in the liturgical year, we are given to understand that the Christian life in this world has many wildernesses. The Church wanders in the wilderness, Revelation 12 tells us. And who of us doesn’t grasp this at a visceral level. Well, the wilderness is the dry place this week’s Gospel talks about, where demons haunt restlessly. In the dry places you hunger and thirst for righteousness, like the Canaanite woman. You learn in the dry places that it’s not bread you hunger for – whatever crumbs there may be – but the Lord’s mercy, His righteousness, the Word that proceeds from the mouth of God. That Word we hunger for is “fiat,” the “let it be” of God’s creative work, the Word that drives demons away. This week’s Gospel ties all these themes together. Jesus uses the illustration of a house to describe the human person. The house is inhabited by demons at peace and rest. Yes, the way of the world in its sin and death is the default. It’s “situation normal.” We can be at rest and peace knowing people will behave like people, and the evils will go on as predicted. We become cynical with our anthem, “Let us eat, drink, and be merry, for tomorrow we shall die.” We laugh and ridicule when the likes of Jesus come around saying things like, “She’s not dead, she’s sleeping.” OK, whatever Lord. When Jesus, the stronger man, comes and overpowers the demons in our house with His finger (lots going on there), He sets up shop. There’s a new sheriff in town. It’s jarring. He’s invaded the realms of Hades itself and shattered its bronze gates, plundering the devil of all his “goods,” the things that belong to him, his possessions, our souls. Now they belong to Jesus. But alas, if the demons after searching a new place for rest find nothing, and come back to their original home, and do not find the stronger man there, the second state will be worse than the first. The moral of the story is clear: don’t let Jesus leave your house. But what does this mean? This seems like a complete switching of gears in the account. It’s not. It happened “as He spoke” about the demons and His overpowering of them, as He laid down the analogy of the house. It’s inserted for a reason. Her words set Jesus up to answer what it means to not let Jesus leave your house. As Jesus teaches about the house and its inhabitants, we come awfully close to the Neoplatonic or Gnostic understanding of the human body: we’re a spirit using a body. The house is the body; the strong man and stronger man are devils or Jesus. What exactly are we in the analogy? Are we the house? We’re definitely not the strong man or stronger man. What then are we? There’s really no answer to this. We’re the house! We are the body! We’re defined by our bodies. But are we just defined by our bodies? When the woman comes, she wants to bless the woman body parts that received Jesus (the stronger man) and nurtured Him: the womb and breasts. She wants to see the human person as just a body. Jesus redirects her, giving a depth of understanding about the redeemed human person. He defines the blessed one not as the body that received him, Mary, but as the person who heard God’s Word and kept it. That too is Mary, of course, who heard God’s Word from Gabriel and certain kept it, and blessed is she. And that helps us understand what’s on in the first part of the text. Yes, the human body is what devils seek to attain whatever rest they think they’ll get, the antidote to their dry places. Yes, Jesus came in the flesh to do battle over our bodies. Our bodies truly are the buried treasures He sought to resurrect. But we are more than body parts. We are hearing persons, and those who hear, and keep the Word – the Word that proceeds from the mouth of God, the true bread we need, the Word of “fiat” that is the crumb that fills us to the full – will be guarded against the devil and his six friends. Where faith is great, the divine “fiat” can do what it has done from the beginning, and that is, create. “Fiat lux et facta est lux.” (“Let there be light, and there was light.”) Like God coming upon the formlessness and void, hovering over the waters, in divine silence, Jesus entered into the region of Tyre and Sidon, ran into this woman with her many negating influences – these demonic influences leading her soul to formlessness and void – and awaited her readiness for His gifts. What was that readiness? It was a heart not in rebellion against Him, but turned toward Him. Of course, what turned her heart toward Him? Was it not He, Jesus Son of David, Himself? For that is what she cried out when she heard He was near. And her prayer, the Kyrie, was the Psalm acting on her. In the end she had as much to do with her daughter’s healing as the formlessness and void had to do with it’s own springing to life after God uttered the divine fiat on it. The woman’s faith was simply the emptying of all reliance on Self, assuming the posture of all creatures whose “eyes look to you O Lord, and you give them their meat in due season.” It was a faith infants are best examples of, as Jesus showed. What was great about it, but the greatness of this emptying of Self coupled with the greatness of the One Who utters the divine fiat. “Let it be” as you desire. As the Psalm says, “Delight yourself also in the LORD, And He shall give you the desires of your heart.” The woman most certainly delighted herself in the Lord, even when He was silent, when His church pushed her away, and when the Lord insulted her. Faith doesn’t let such tests detract from delighting in the Lord. Faith delights in the Lord when the Lord doesn’t seem to be responsive. Isn’t that what a marriage is? He forgives us our sins; we delight in Him amidst His tests. But we never “give up” on each other. That might be a crude way to speak, but understood properly you see the point. Another beautiful passage reflecting on this Gospel’s conclusion is, “Hope deferred makes the heart sick, But when the desire comes, it is a tree of life.” The woman’s heart was sick. Her desire was for the demon to go away. When Jesus came, her desire came – again, the reason she didn’t allow Him to leave without having mercy. And when Jesus uttered the “fiat,” the “let there be,” it was a tree of life. “A wholesome tongue is a tree of life.” And Jesus’ words were that, the very Tree of Life from the beginning that brought life into existence, “Let there be” light, firmament, lights, and all the items of creation. Adam’s sin would return it all to the dust, a creation groaning under the fall, collapsing into non-being. But great faith presents the “materia” – our very burdened bodies and selves – from which the Lord will re-create His world. A world without demons and their influences. Those who desire that, who ever pray “Lord, have mercy,” will be granted it. Faith accepts no other result. So the Canaanite woman taught us. Or better, so Jesus lifted up the Canaanite woman’s example to teach us. Friday of Reminiscere: Insulted by the Lord? Now we get to the woman’s final challenge. This one is almost too much to bear. God insults her, calling her a little dog. But as we discussed in our Sunday meditation – and this gets back to the name of this week’s Gospel, Reminiscere (“remember, O Lord!”) – to be engaged in conversation and have words spoken for you is to have your existence recalled to mind, and when the one doing that recalling is the Lord, that is actually a good thing. So Jesus’ insults are at least an acknowledgment of the woman’s existence. Before it was only silence. I guess, His disciples’ complaining about her began the process of her being put on His mind. In the same way the Church, no matter how perverse it can become as an institution, because it’s loved by the Lord at least puts on His mind those who seek it out. The Church is the gateway to the Lord, being the guardian of His doctrine for the people, and the presenter of sinners and suppliants to the Lord. In any event, the woman comes on the Lord’s radar, and that’s a good thing. It’s not unlike how psychologically we’d often rather be hated by someone we care about than forgotten. To be hated is at least still to be a “thing” in someone’s mind; to be forgotten is to be a nothing. In the midst of this word is the woman’s yelp – “Lord help me!” – that led to Jesus making the metaphor of bread and dogs, thereby granting the woman entrance into His words, like a character given a script and allowed on stage. She’s part of “the little dogs.” Well, even little dogs get listed in the credits! And of course she runs with it, seeing an opening for her dogs at the foot of the table eating the bread crumbs. If that’s what it takes, she’ll take it. She also must have known Jesus’ words about the faith of a mustard seed, because she’s convinced that a crumb would be enough to cast a demon out of her daughter. Maybe it’s not moving mountains, but when you’re a parent, moving mountains is a parlor trick compared to what you want if your child is sick. Let’s develop Jesus’ Word a bit, because especially in the Gospel of Matthew, we have to understand it in the larger catechetical structure of that Gospel. In any event, first Jesus suggests an opening up of what the “lost sheep of the house of Israel” are, simply by where He locates Himself. Second, He uses the bread image to describe the current situation He’s in: a woman begging for help for her daughter. There’s two parts of this image, first that human need is a human hunger, and second that He can fulfill it with a sort of bread. Putting it all together, Jesus says He came for lost sheep, found anywhere, who pray “Lord have mercy,” hungering for the bread of salvation, and He will fulfill it. Remember when we meditated that all of the Scripture is liturgical? And we haven’t even gotten to the further fulfillment of Matthew’s “bread” theme. Jesus had just fed the 5,000 a chapter earlier, commonly seen as the “Jewish” feeding of the multitudes. And the next chapter Jesus feeds the 4,000, often seen as the “Gentile” feeding of the multitudes. Yes, Jesus will give the gentiles the bread of salvation, the bread of which He says “This is My Body,” feeding their deeper hunger for righteousness, for mercy, for salvation. 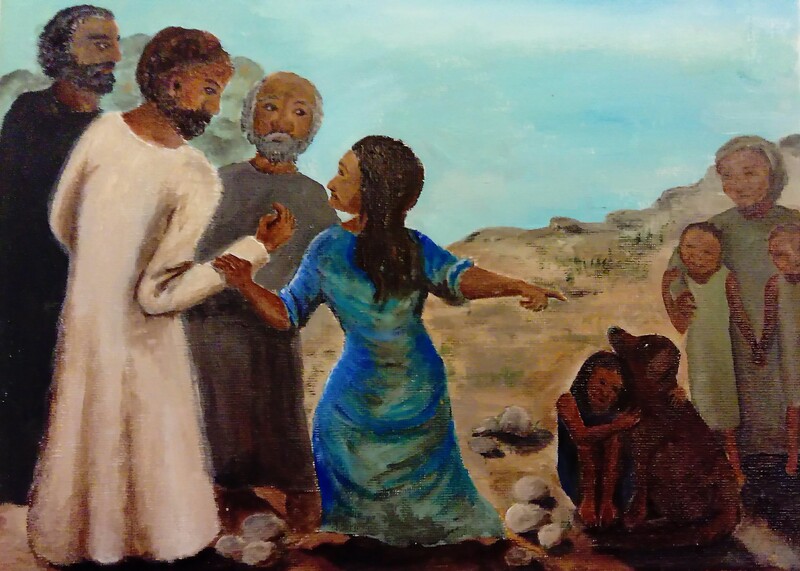 The Canaanite woman led the way, responding with the Kyrie when Jesus sought out lost sheep in Tyre and Sidon.